I'd just finished typing my blog and was feeling a little pleased with myself thinking I'm starting to get the hang of this when the post I was working on disappeared. I'm not sure what I did (obviously something wrong) so now I have to re-type it. I'd never heard of blogs until Barb Smith (Woodcutter's Daughter) told me about them at the Girls Day Out last May. That started me thinking and everytime I mentioned blogs to Jan she kept encouraging me to start one. And just over two weeks ago, much to my surprise and I think Jan's, that's what I did. I just decided that I could not put it off any longer. The encouragement I have received from your comments has been most gratifying and kept me going. Now I know you all love pictures. There will be one next time, I promise, but I have added two albums with pictures of my Christmas patterns, bags and sewing accessories. So please take your time and have a browse. You'll find stockist details under the heading "Pages". There hasn't been much time for sewing in the last couple of days as any available time has gone into working on this weblog and I am still not entirely happy. I'd change one thing and this would alter something else. Then I couldn't remember what I had to begin with or where to find it to change it back. And then sometimes instead of selecting preview I would select save changes and the site was updated. Its all good fun and very rewarding as I (very) slowly work out what I am doing. Photos are the next big challenge! When I wasn't working on the weblog I did manage to start on a a new needle punch design for Christmas. I can only work on it during the day because I find my lighting is just not good enough at night to play with colour combinations. I love Christmas decorations in all colours. Well here goes. This is a big leap for me. I really don't understand how this (blogging) works, how it will turn out or what you will see. So keep checking for developments as I work out what I'm doing. I have been designing now for just over 4 years, starting with cloth dolls then stitcheries. I love Christmas decorations, quick and easy projects for gift giving. 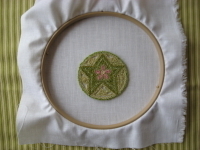 At present I'm hooked on punch needle and am busy thinking up new designs for Christmas. There are definitely not enough hours in the day. Here are some fabrics and threads that I have been playing around with this morning. Of course they will probably change as the project develops.